Kensington Preschool is open to children 2 to 5 years of age. The school is operated on a non-discriminatory basis, according equal treatment and access to services without regard to race, creed, or religion. A total of 44 children may be enrolled each day. A waiting list is kept throughout the school year. Contact our Preschool Director, Connie Cleland, at either connie@kensingtonucc.com or call 619-284-1129 to make an appointment to tour our campus. Tuition is based on a selected yearly payment and is divided into ten equal payments due by the 1st of each month, September through June. Those who enroll later in the year will have tuition prorated. Special rates may apply to families with more than one child in the Preschool or for those who elect to pay annually or semiannually in advance. Most sessions are based on two or three mornings per week. 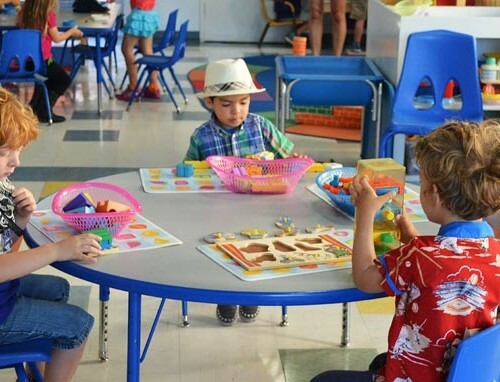 Four-year-olds may attend up to five mornings per week for the appropriate fees if space is available. Please call for current monthly rates.